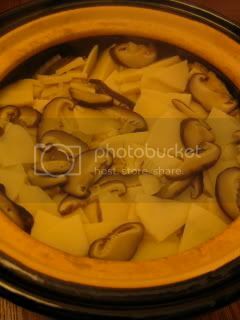 HAPPY DONABE LIFE - Mrs. Donabe's Rustic Japanese Kitchen: Takenoko Gohan (Bamboo Shoot Rice)...Spring is Here! Takenoko Gohan (Bamboo Shoot Rice)...Spring is Here! Takenoko Gohan (bamboo shoot rice) is one of the most popular rice dishes in the spring season in Japan. Since you can find the vacuum-pack cooked bamboo rice at (Japanese) grocery stores, you can also enjoy this delicate spring flavor year-round, too. It's so easy to cook with the donabe rice cooker. I posted the recipe in toiro's website. "Kamado-san" on Los Angeles Times! Iberico Pork Shabu Shabu...Real Treat!